The generalized (Glen) flow relation for ice, involving the second invariants of the stress deviator and strain-rate tensors, is only expected to hold for isotropic polycrystalline ice. Previous single-stress experiments have shown that for the steady-state flow, which develops at large strains, the tertiary strain rate is greater than the minimum (secondary creep) value by an enhancement factor which is larger for shear than compression. Previous experiments combining shear with compression normal to the shear plane have shown that enhancement of the tertiary octahedral strain rate increases monotonically from compression alone to shear alone. 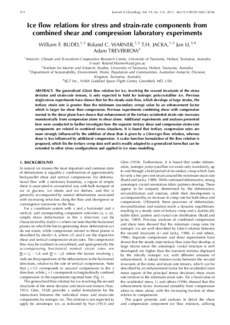 Additional experiments and analyses presented here were conducted to further investigate how the separate tertiary shear and compression strain-rate components are related in combined stress situations. It is found that tertiary compression rates are more strongly influenced by the addition of shear than is given by a Glen-type flow relation, whereas shear is less influenced by additional compression. A scalar function formulation of the flow relation is proposed, which fits the tertiary creep data well and is readily adapted to a generalized form that can be extended to other stress configurations and applied in ice mass modelling.